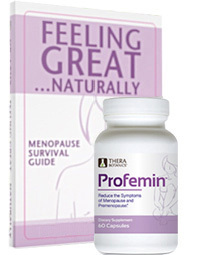 "Profemin™ is the #1 choice for women today." 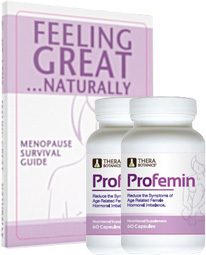 Profemin is SCIENTIFICALLY shown to help relieve the major symptoms of menopause quickly, safely and naturally. A U.S. clinical study of Profemin showed that over 96% of women experienced significant relief from 4 OR MORE of the most common, disruptive menopausal symptoms within 6 weeks– and without harmful side effects. Some women even reported relief IN AS LITTLE AS A WEEK! Try Profemin™ TODAY and see the great results for yourself! All you pay now is just $9.95 shipping & processing! Then in 30 days, unless you call to cancel, you'll be billed just $39.95 per each month's supply. FREE "Feeling Great Naturally – the Menopause Survival Guide"
$10 OFF OUR BEST OFFER! You will be shipped 2 bottles of Profemin, which represents a 60-day supply. You save $10 per order by paying today, so all you pay is just $34.95 per bottle ($69.90 per shipment) plus $9.95 shipping and processing! You are covered by our 30-day Money Back Guarantee less S&P! Should you decide to keep your initial supply of Profemin, you will never want to run out. So, unless you call to cancel, we will send you a new 2-bottle, 60-day supply of Profemin billed to your credit card every 60 days at $39.95 per bottle ($79.90 per shipment) plus $9.95 S&P. You can stay on the program as long as you want and cancel at any time! Available for customers who prefer not to commit to an auto-ship program. You will be shipped 1 bottle of Profemin™ which represents a 30-day supply, for $59.95 per bottle plus $9.95 S&P. 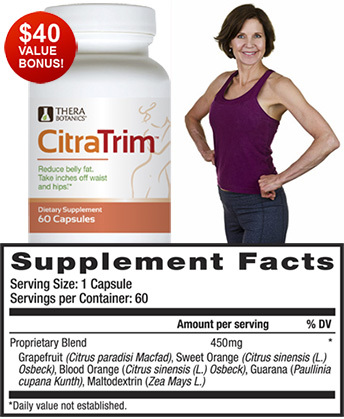 Look & Feel your Best - Get your FREE bottle of CitraTrim™! A $40 value - FREE, just pay $7.95 shipping and handling! Many women experiencing age-related hormone changes have trouble with weight control, body composition, and energy levels. That's why Profemin™ developed CitraTrim™ which contains a unique patented blend of natural citrus extracts for weight loss and body composition and guarana for energy. In a scientific study, women taking CitraTrim™ and eating a sensible diet saw a reduction of 10% in body fat and lost two inches off both their waist and hips in just 90 days. A 30-day supply of CitraTrim™ is a $40 value, but with your Profemin order today you can get it for free - just pay $7.95 shipping and processing. HURRY! GET YOUR FREE GIFT AND SAVE $40 WHILE SUPPLIES LAST! 30-day money-back guarantee ( less s&p ).